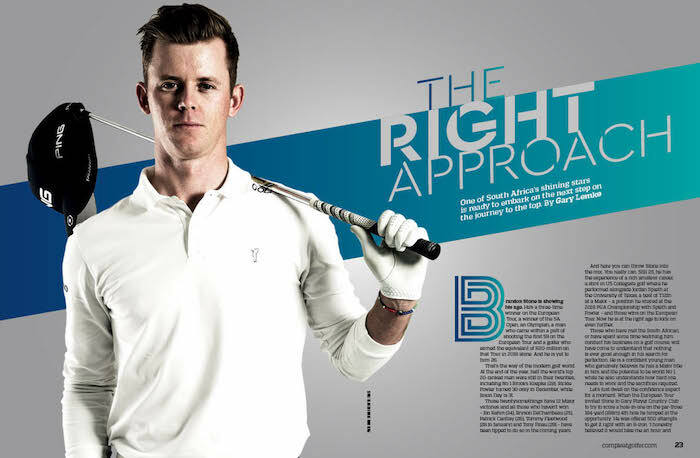 One of South Africa’s shining stars is ready to embark on the next step of his journey to the top, writes GARY LEMKE in Compleat Golfer. Brandon Stone is showing his age. He’s a three-time winner on the European Tour, a winner of the SA Open, an Olympian, a man who came within a putt of shooting the first 59 on the European Tour, and a golfer who earned the equivalent of R20-million on that Tour in 2018 alone. And he is yet to turn 26. That’s the way of the modern golf world. At the end of last year, half of the world’s top 20-ranked men were still in their twenties, including No 1 Brooks Koepka (28). Rickie Fowler turned 30 only in December, while Jason Day is 31. Those twentysomethings have 12 Major victories between them, and all those who haven’t yet won – Jon Rahm (24), Bryson DeChambeau (25), Patrick Cantlay (26), Tommy Fleetwood (28 in January) and Tony Finau (29) – have been tipped to do so in the coming years. And here you can add Stone to the mix. You really can. Still 25, he has the experience of a rich amateur career, a stint in US Collegiate golf where he performed alongside Jordan Spieth at the University of Texas, a best of T12th at a Major – a position he shared at the 2018 PGA Championship with Spieth and Fowler – and those wins on the European Tour. Now he is at the right age to kick on even further. Those who have met the South African, or have spent some time watching him conduct his business on a golf course, will have come to understand that nothing is ever good enough in his search for perfection. He is a confident young man who genuinely believes he has a Major title in him and the potential to be world No 1, while he also understands how hard one needs to work, and the sacrifices required. The video went viral and attracted nearly 180 000 views on YouTube, and apart from the frustration the golfer showed – and he remained adamant that a few descriptive words and a throwing of his club should not be edited out – ‘That’s me in my office at work. Are you going to tell me people in other professions don’t show frustration in the office?’ – there were the physical reminders. ‘I was raw in the “V” between my fingers from pushing the tee into the ground,’ he says of the experience. In a year that Stone was tipped by the great Gary Player as a potential winner of the 2018 Open Championship at Carnoustie, the 25-year-old’s form fell off as we headed into December, with a tie-46th being the best return of his last five tournaments before the Alfred Dunhill Championship at Leopard Creek. There was a simple, and understandable explanation for this. ‘I was fatigued, having had two months of a strenuous programme with Gavin Groves [former head of strength and conditioning at TuksGolf Academy]. I need to be the most professional professional I can be and control the controllables. I can’t control the bounce the ball might take on landing, or a putt affected by a spike mark, but I can control my fitness, diet and strength, and so on. The European Tour stats for 2018 had Stone’s average drive at 303.21 yards with an accuracy of 50.83%. Should he increase closer to an average of 310 yards (283m) and start hitting 60% of fairways, expect to see him crash through the top 100 in the world again and move sharply towards the top 50. Sometimes, considering what Stone has crammed into his life, it’s hard to imagine that he’s still 25. Last September he got married and one of his groomsmen was Proteas cricketer Aiden Markram. It’s as if the two have been mates forever and it’s a friendship born out of the one of their respective fathers, Kevin and Vic. Many people reckon the modern golfer is overpaid, and when Tiger Woods and Phil Mickelson staged ‘The Match’ in Las Vegas in November, Mickelson won $9-million for winning over 22 holes. Stone may have earned the equivalent of over R20-million on the European Tour last season, but he is quick to correct the perception that golfers pocket all the money at the level he is at. Stone, who was excited to accept the position of Compleat Golfer playing editor, explains that he has always been interested in sports media, and when he went to Texas it was with an ambition to study journalism. However, he quickly found it wasn’t what he had envisaged. What Stone didn’t add was that his freshman year (2012-13) was as impressive as Spieth’s was in his own freshman year 12 months earlier. They both won three of their 12 tournaments and their statistics virtually mirrored each other’s. The American has gone on to win three Majors and become a world No 1, which again highlights an earlier point that when it comes to Stone, there are plenty of reasons to believe he too is going to go all the way to the top. Is his dad as much of a petrolhead? That’s the way Stone goes about his life, with a smile on his face, an energy and enthusiasm that is infectious, but behind all that a steely mentality and a determination to make the most out of every situation.